Standing bright and tidy and picturesque under the blazing sun of the South Carolina Lowcountry, the red wooden church and schoolhouse, encircled by a sleepy parish cemetery, embody a history that is far more complex and uncommon than the simple buildings might at first glance suggest. Saint James the Greater Catholic Mission, the epicenter of the historic community known also as “Catholic Hill,” is home to one of the state’s rare enclaves of rural Catholic blacks. Irish Catholic planters established the mission parish in 1831 and two years later built a simple fifty-by-twenty-eight-foot wooden church.1 Among the founding parishioners were also several intertwined branches of the prominent and affluent South Carolina Pinckney and Bellinger clans, former Anglo-Episcopalians who had recently converted and brought with them into the Church scores of slaves. Before long, the black slaves outnumbered the white parishioners of Saint James, and the congregation became predominantly black. The establishment of another Catholic parish in nearby Walterboro in 1845, followed by a field fire that destroyed Saint James Church in 1856, followed by the chaos and dispersion occasioned by the Civil War, all contributed to the state of isolated, swampy oblivion into which the Saint James blacks gradually descended. Virtually lost by the Charleston diocese (which then, as it does now, encompassed the entire state of South Carolina), the small band of Catholics was left with neither a church building nor clerical attendance for over thirty years.2 Some combination of saintly perseverance and tenacious faith ensured that the group remained nonetheless in place, centering their tightly-knit community of believers on and around the original site of the cemetery, which to this day contains the graves of the first Irish American parishioners. 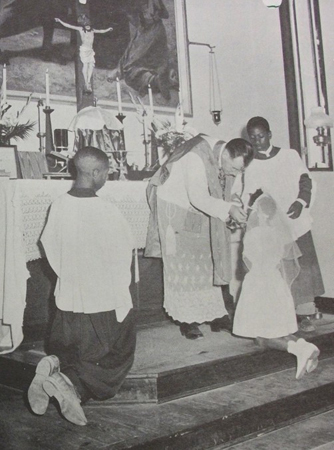 It was not until 1892, with the arrival of Pallotine missionary priest Daniel Berberich, that the African Americans of Saint James came to be concretely reestablished in the diocese. Berberich and the diocese almost always referred to the mission as “Catholic Crossroads”; however, the parishioners remembered who they were and immediately christened their new church, built under Berberich in 1894, “Saint James the Greater.”3 The new Saint James was a frame side-steeple chapel, and seven years later it was joined by a two-story, matching white clapboard schoolhouse, with a central, gabled-entry porch that echoed the front-gabled vestibule porch entry on the church. The funding to build and operate the school for sixty years came largely from Mother Katharine Drexel and her Sisters of the Blessed Sacrament in Cornwells Heights, Pennsylvania. The schoolhouse, bearing its original wooden siding and gabled front porch, still stands today. Parish history maintains that the schoolhouse was built over some of the parish’s earliest, sunken graves. Even now, a stone sarcophagus lies just a footstep west of the school, bearing an inscription for Irish-born James McKain, who died in South Carolina in 1835. 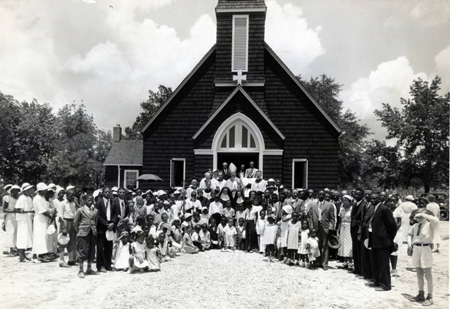 Berberich’s church was replaced in 1935 with the current shingled church. A testament to a vibrant parish and a dynamic priest, the side-steeple chapel became too small for the growing parish. Damage caused by a tornado was the final straw, and Father Alfred F. Kamler, who led the mission from 1933 to 1940, arranged for a third church to be built. The man chosen to design the new Saint James church was Father Michael McInerney, O.S.B., a priest-architect from Belmont Abbey College near Charlotte, North Carolina. McInerney was a natural choice, a monk who over the course of his career designed over two hundred Catholic churches and dozens of convents, hospitals, and schools throughout the South. McInerney, of course, was not merely an architect but a priest as well, and his work proclaimed this dual vocation. In addition to designing cathedrals and large urban churches for middle-class, white congregations, McInerney drew up plans for tiny, rurally located, and financially straitened Catholic parishes in Maryland, West Virginia, Virginia, the Carolinas, and Georgia—parishes that could have offered him little financial return for his services. Regrettably, Saint James the Greater is one of few remaining examples of McInerney’s rural Southern churches, as many today have been demolished or replaced by new and larger modern buildings. The style and materials of Saint James are characteristic of the kind of churches that the priest-architect typically designed for rural, poorer congregations. His Gothic taste is expressed in a simplified, vertical form by the tall, central bell tower spearheading the façade, and a Gothic-arched transom situated over the front entry doors. The exterior of the church is distinctive for the region, particularly for a Catholic church. While many rural churches in South Carolina are clad with wood, very few are faced entirely with wooden shingles. McInerney chose stone or shingled exteriors for many of his country churches; in fact, if there stands a historic church in the Carolinas or Georgia that is Catholic, rurally located, and clad completely in shingles, it can almost certainly claim Father Michael McInerney as its architect.5 Saint James is covered in square-butted cedar shingles, originally stained brown and now painted a vivid red (matching the schoolhouse, whose white siding was likewise painted red in the late 1950s). The roof of the church was also originally covered in cedar shingles, these stained red. In addition to giving the church an attractive and rustic appearance, the use of cedar was also practical: cedar trees are abundant in the swampy area, providing a relatively inexpensive and durable material. Like all of McInerney’s small, rural churches, Saint James is laid out on a simple rectangular plan. In addition to the central space, the church possesses a wing located on the rear (north) west corner of the building. This additional space may have been able to exist in thanks to the largesse of New York donors Mr. and Mrs. Edwin Denby, likely friends or family of Father Kamler. Edwin Denby was an architect with offices in New York City and Bay Harbor, Maine, where he designed churches, schools, and residences.6 The rear west wing features an elegant, recessed Gothic doorway, giving entry into what is now the sacristy and “priest’s room”—where missionary priests bedded overnight during their visits to the parish.7 The cozy room still contains its original brick fireplace with a simple wooden mantel and decorative brass hearth, as well as original five-paneled wooden doors. The nave of the church is perhaps most striking of all. 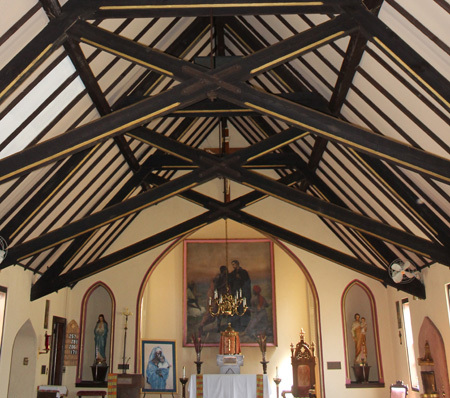 Dark-stained timber trusses, a typical McInerney design feature, boldly embellish the interior sanctuary with gold-chamfered edges and cast-iron bolts. Gothic arches frame the apse and the side statue niches at the front and back of the nave. Rectangular sash windows on the side walls rest in their original, deeply recessed heart-pine frames. Interspersed with the windows are the Stations of the Cross, depicted on painted wooden panels set in shallow niches on the coarse sand-finished plaster walls. Unadorned wooden pews and floors are yellow pine, with (modern) carpet overlaying the central aisle. As one’s gaze travels down the nave, taking in the handsome ceiling beams, arches, and pleasing interior symmetry, it rests finally on the artistic jewel of the sanctuary, an 8½-by-7½-foot altarpiece depicting Saint Peter Claver ministering to African slaves in Cartagena. The oil painting is signed by Czech painter Emanuel Dite, who was well known in Europe from the 1860s to the 1890s. 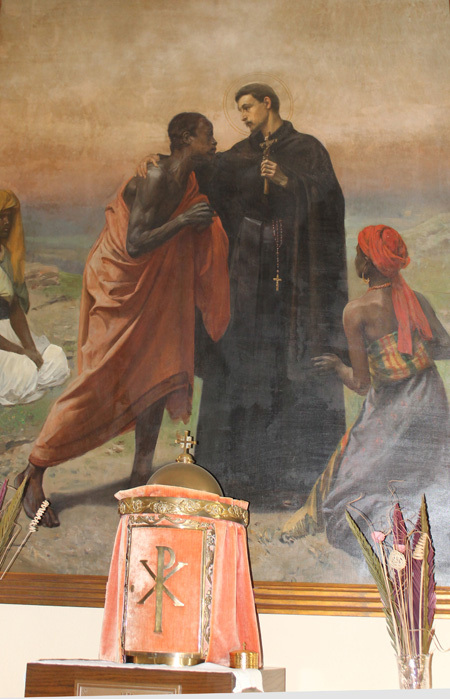 Historic photographs show that the painting hung in the second Saint James Church built by Berberich, and the date with which the work is signed—1894, the year that Berberich’s church was completed—suggests that Berberich arranged for the painting to be brought to the mission parish soon after the church’s construction to serve as its altarpiece. The subject matter spoke poignantly to the congregation of former slaves and children and grandchildren of slaves. However, the exact circumstance of the European painting’s arrival to this remote, swampland church is a mystery, reflecting the larger enigma of the parish’s unlikely survival through years of obscurity, rural seclusion (the railroad did not venture into the vicinity until 1887), poverty, and a mood of anti-Catholicism and racism pervasive in the nineteenth and early twentieth-century South. Saint James the Greater Church gives humble, organic architectural expression to the continuity and hardiness of this remarkable black Catholic Lowcountry parish. McInerney’s work, resting on the shoulders of Father Daniel Berberich, Father Alfred Kamler, and generations of faithful parishioners, roots the community in its past while simultaneously joining it to the wider, universal Catholic tradition. 1. “South Carolina. Charleston,” United States Catholic Miscellany (Charleston, SC), January 29, 1831; “Dedication of St. James Church,” United States Catholic Miscellany, December 10, 1833. 2. Josephite missionaries tended nearby black missions such as Bennet’s Point and Hutchison’s Island, and while it is possible that mission priests were aware of or even occasionally attentive to the Saint James blacks, there is no explicit and unambiguous reference made to them until the late 1880s—though missionaries do frequently mention various and unidentified “colored missions”—and they are not listed in the National Catholic Directory until 1890. 3. Daniel Berberich to Andrew Walter, 4 February 1895, folder 7, Newspaper Clippings 1831–2003, Saint James Parish File, Diocese of Charleston Archives, Charleston, SC. 4. North Carolina Architects and Builders: A Biographical Dictionary, s.v. “McInerney, Michael (1877–1963),” by Paschal Baumstein, accessed October 2014–February 2015, http://ncarchitects.lib.ncsu.edu/people/P000485; Paschal Baumstein, “Belmont Abbey Historic District, Gaston County, NC,” National Register Nomination, 1993, accessed November 2014, http://www.hpo.ncdcr.gov/nr/gs0020.pdf. 5. 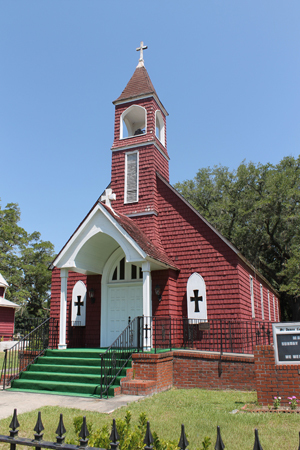 Two of the few surviving examples are Saint Louis Catholic Church in Dillon, South Carolina, and the former Saint John Catholic Church in Bishopville, South Carolina—now converted to a house. 6. “Edwin Denby, Architect,” Graphic Arts Collection: Rare Books and Special Collections, Firestone Library, Princeton University, accessed June 2015, https://graphicarts.princeton.edu/2014/05/02/edwin-denby-architect/. 7. “History of St. James,” Saint Mary Church, Aiken, South Carolina, 1976, folder 9, “Files Re History of St. James the Greater Mission from the Archives of St. Elizabeth’s Convent, Cornwells Heights, Pa,” Saint James the Greater Parish File Box, Diocese of Charleston Archives.